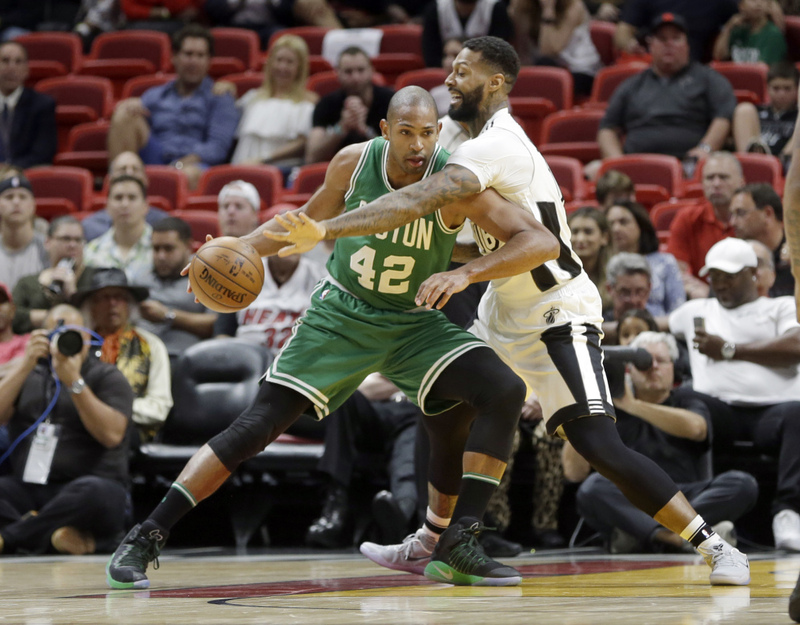 MIAMI (AP) — Isaiah Thomas scored 23 points before getting ejected, Avery Bradley added 20 and the Boston Celtics built a huge early lead on the way to beating the Miami Heat 105-95 on Sunday night. Al Horford had 17 points, eight rebounds and seven assists for the Celtics. They led by 22 in the first half and beat Miami for the fifth consecutive time. Miami turned the ball over 23 times, and Boston converted those into 24 points. And the Heat, the worst free-throw shooting team in the NBA, went 6 for 14 from the line in the fourth quarter. Goran Dragic led all scorers with 31 points for Miami. Hassan Whiteside finished with 23 points and 17 rebounds, all but one of those rebounds coming in the second half. Thomas was ejected with 3:02 left for elbowing Justise Winslow in the face, bloodying the Heat forward and being assessed with a flagrant-2 after a lengthy review. Winslow missed both resulting free throws – part of that season-long Miami problem – but the Heat seemed sparked nonetheless. In just over a minute after Thomas’ ejection, the Heat had what was a 12-point deficit down to 97-93. Dragic connected on a 3-pointer from the right corner with 2:04 remaining and Tyler Johnson added a free throw not long afterward. But Horford’s three-point play with 1:29 left made it a three-possession game again, and Boston would escape. Celtics: Boston’s 22-point lead was the biggest deficit the Heat have faced at home this season. Utah led Miami by 21. The Celtics also led by 19 in their win in Miami earlier this season. … Former Heat guard Gerald Green (sore left hip) was sidelined. … The Celtics scored on each of Miami’s first five turnovers, getting 12 points out of them on the way to building the 22-point early lead. Heat: Dragic made his first five 3s, finishing 5 for 6. … Wayne Ellington (hamstring) was out and is listed as day to day. His absence made Josh Richardson a starter, giving Miami its ninth different lineup. … Dion Waiters (groin) missed his 12th consecutive game. … Whiteside’s third block gave him 457 with Miami, passing Joel Anthony for No. 4 in team history. The Heat are on pace for the worst free-throw shooting season in franchise history. Sunday’s 14 for 25 effort dropped Miami’s season percentage to .662. The 2004-05 Heat shot .672 for the franchise low mark. Celtics: Visit Memphis on Tuesday night, the second game of a three-game trip. Heat: Host Orlando on Tuesday night, the next-to-last game in this season-long six-game homestand.